I blame Nike for this craze over basketball socks. At the time when other companies are selling 3 pack socks for $10, Nike sets out a supposedly superior socks with cushioned for $12. Outfitted the NCAA kids, made other juvenile kids wanted them and gave resellers more fuel to make that money. I mean, it was so ridiculously LIMITED (Nike did not anticipate the popularity) that $12 socks goes for $150 in the secondary market. Moms were willing to cough up big money so their sons/daughters can wear those ELITE socks at their AAU tournament so they would look as cool as the NCAA kids. As always, adidas is a step behind in everything, actually they are 2 years behind in coming out with their own version of the ELITE socks. 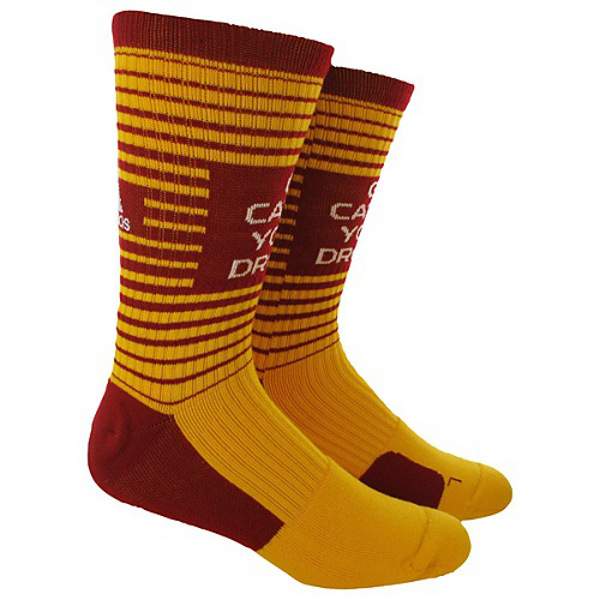 But the adidas version though started off with the NBA All-Star socks, continued to their Baylor neon socks and now as soon as the Washington Redskins announced they will pick Robert Griffin III with the second pick the 2012 NFL Draft, the 3-Stripes made up a pair of burgundy and gold Team Speed Crew socks with RGIII's motto “Go Catch Your Dream” that he wore on draft night. Of course like everything in the U.S these days, the socks went on sales yesterday and it was quickly snapped up by resellers. So “Go Catch Your Dream” resellers!